Grown throughout the tropical regions of the world, the plantain is a close relative of the banana, making important contributor to the economy of many countries. The nutritional value of unripe plantain makes it stand out as a very important addition to any healthy living diet plan due to its nutrient content. Practitioners of traditional medicine have long prized the starchy fruit for its medicinal properties, which reputedly include an ability to cure ulcer. It is used in herbal medicine to treat sluggish bowels, to heal wounds, to fight skin infections, to reduce phlegm, to soothe urinary tract infections, and to ease dry coughs. Most ulcers are not caused directly by stress but by the bacterium Helicobacter pylori, which is why ulcers today are often treated with antibiotics along with an acid suppressor. Studies on rats with ulcers caused by daily aspirin use have shown that unripe green plantain can both prevent the formation of ulcers and help to heal them. The agent believed to be responsible for plantain’s curative effects was tested it in rats. Scientists reason that the starch in plantain’s unripe form helps to decrease acidity and reduce irritation. It stimulates the cells on the lining of the stomach to produce mucus that is thicker, which guards against acid aside its elimination of stomach bacteria that has been pointed as the main cause of ulcers. Moreover, in a review that appeared in a 2002 issue of the “Indian Journal of Pharmacology,” two researchers that chronicled more than 30 years of research into the curative properties of dried powder of unripe plantain also conclude that the plantain powder is a potent herbal remedy for the treatment of peptic ulcer disease. Medical research confirms that the plantain is also good for many of life’s ailments including diabetes. Unripe plantain has the potential of lowering blood sugar, according to a study, titled “Hypoglycemic effect of methanolic extract of Musa paradisiaca (Musaceae) green fruits in normal and diabetic mice”. It was published in Experimental Clinical Pharmacology by J. A. Ojewole and C. O. Adewunmi. Although this group of researchers do not know the precise mechanism of the hypoglycemic (blood sugar-lowering) action of unripe plantain, they suggested that it could be due, at least in part, to stimulation of insulin production and subsequent glucose utilisation. See also M Denise Robertson, et al., Insulin-sensitizing effects of dietary resistant starch and effects on skeletal muscle and adipose tissue metabolism, Am J Clin Nutr September 2005 vol. 82 no. 3 559-567. Nevertheless, the findings of this experimental animal study indicate that unripe plaintain possesses hypoglycemic activity lends credence to its folkloric use in the management and/or control of adult-onset, type-2 diabetic mellitus among the Yoruba-speaking people of South-Western Nigeria. In addition, diabetic patients are more prone developing stomach ulcers because they are at risk to acquire H. Pylori infection due to their blood glucose concentration levels. Unfortunately, the high blood sugar also contributes to a delay in the healing of this ulcer. But Indian researchers, looking into the benefit of unripe plantain in diabetic animals that also had ulcer, indicated that it could be more effective in diabetes with concurrent gastric ulcer. In the studied animals, they said the extract of the unripe plantain promoted ulcer healing because of its effects on the lining of the intestine by stimulating cells on the lining of the stomach to produce mucus that is thicker, thus given the ulcers time to heal. It also reduced the free radicals that were generated. They wrote: “extract of Musa sapientum fruit (MSE) showed antidiabetic and better ulcer healing effects compared with OMZ (Omeprazole an antiulcer); or INS (insulin) in diabetic rat and could be more effective in diabetes with concurrent gastric ulcer. 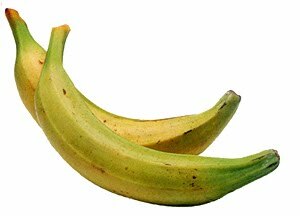 They reasoned that the presence of many chemical substances like flavonoids, saponins, glycosides and alkaloids in unripe plantain probably contribute to ensuring healing of chronic diabetic gastric ulcer, concluding that “unripe plantain could be a better choice in diabetes with concurrent peptic ulcer”. Previously, a meal of unripe plantain with local spices like cloves, onions, garlic and ginger has been purported as the answer also to erectile dysfunction, low sperm count, kidney problems and high blood pressure. How is it used in the treatment of erectile dysfunction or low sperm count? Reverend Fr. Anslem Adodo, Director, Pax Herbal Clinic and Research Centre Ewu, Edo State, who was of the opinion that roasted plantain is good for men, suggested that men should make it a habit of eating one or two roasted plantain daily. Reverend Fr. Anslem Adodo added: “Take more plantain or unripe bananas. They help to rejuvenate the sexual organ with high level of potassium. Include garlic in every meal. Garlic is generally a good anti oxidant and a good remedy for impotence in particular. Include ginger in every meal too. Ginger has healing properties to treat erectile dysfunction. Informative article, quite educational,Jah Bless. Sade Oguntola. AM QUITE CONFIDENT NOW THAT PLANTAINS WERE MEANT TO BE A REMEDY RATHER THAN FOOD TO US BY JAH ALMIGHTY!